Boat Nautitech 46 Fly called Julia has been manufactured in 2019. Julia is licensed for 10 crew members. Layout of the yacht is 10. Nautitech 46 Fly Julia is equipped with 6 cabins. For guests disposal there are 4 heads. With motor 50 Julia can sail really fast. 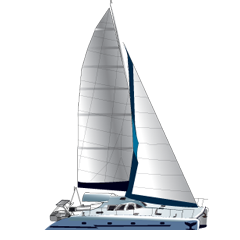 Yacht's equipment consists of : Air conditioning, generator, Gps plotter, Autopilot, Mainsail with lazy jack. . Security caution accounts for 5000.00 EUR. Choose our offer and enjoy your holidays on the deck of Julia.